Acknowledged author Christopher Slobogin wrote Law and the Mental Health System, Civil and Criminal Aspects (American Casebook Series) comprising 1525 pages back in 2013. Textbook and etextbook are published under ISBN 0314267298 and 9780314267290. 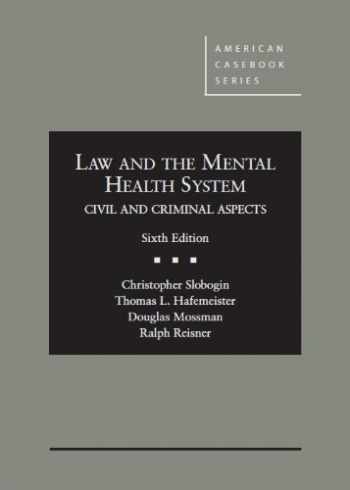 Since then Law and the Mental Health System, Civil and Criminal Aspects (American Casebook Series) textbook received total rating of 4 stars and was available to sell back to BooksRun online for the top buyback price of $90.63 or rent at the marketplace. Slobogin, Hafemeister, and Mossman's Law and the Mental Health System, Civil and Criminal Aspects, 6th offers a wide-ranging, in-depth coverage of how the legal system responds to challenges posed by persons with mental disorders. It features a sophisticated interdisciplinary treatment of the law and literature relating to regulation of the mental health professions, the government’s authority to deprive people with mental disorders of their liberty and property and its obligation to provide support for people with mental disorders and protect them from discrimination. The new edition is enhanced by the addition of two new authors, Thomas L. Hafemeister, J.D., Ph.D., and Douglas Mossman, M.D. They join Christopher Slobogin, J.D., LL.M, and Ralph Reisner.